The Ice.bag® concept has revolutionned the regular use of the simple ice bucket. Flexibale, customizable and multifonction, the ice bucket Ice.bag® is perfect for professionals and private individuals. The most frequently asked questions by our customers! Can the Classic Ice.bag® size contain a bottle of champagne ? 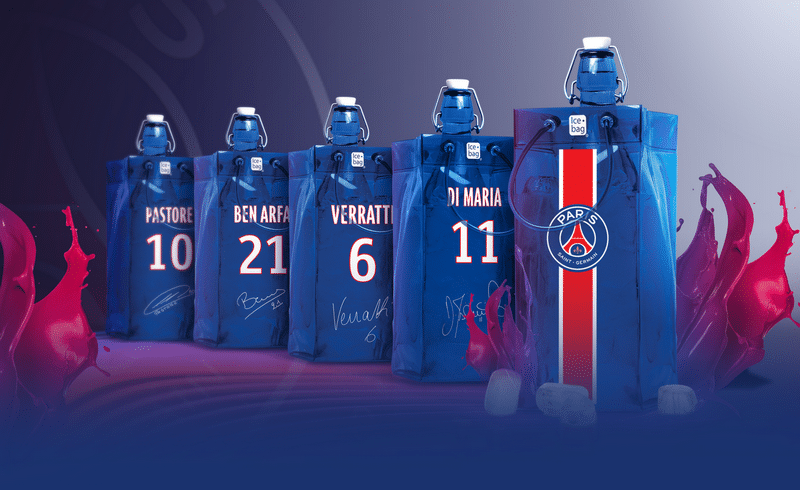 Yes the classic Ice.bag® size can contain all type of bottle from 0,5 to 1 liter. Does the Ice.bag® have to be placed in the freezer to be able to refresh bottles ? No, absolutely not! 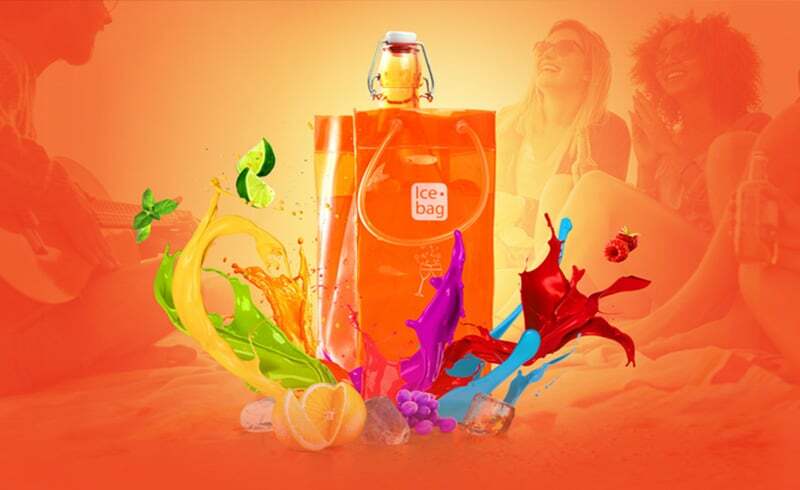 The Ice.bag® is a refreshing device, but it doesn’t need to be refreshed itself! In order to cool your bottle, first put fresh water in it, then add ice cubed, and finally put your bottle in. In 15 minutes, your bottle is perfectly cooled! By placing the Ice.bag® in the freezer, you would actually weaken the PVC, which is flexible but could become brittle as a result… Hence the fact that it is clearly discouraged. How long does it take to the Ice.bag® to refresh a bottle ?? With the help of fresh water and ice cubes, it takes only 15 minutes to refresh your bottle in the Ice.bag®. How long is it possible to use an Ice.bag® ? Ice.bag® is a sustainable and reusable product, not a simple packaging to throw away after use. It can last more than a year if the instructions of use are duly respected. The models from the PRO Collection are they accessible to purchase by unit ? No. The Ice.bag® models from the PRO Collection are reserved for professional users and are not to be sold individually. As a consequence, they can be purchased only by full boxes. What are the approximative delivery terms for a customized Ice.bag® ? According to your request, the customization of one of our existing model or the specific making of an entirely personal Ice.bag® as per your bill of specification can require from 4 to 14 weeks after the confirmation of your design. For more information, please contact our commercial department via the Contact page. Can the Ice.bag® refresh sparkling wine as well ? Absolutely. 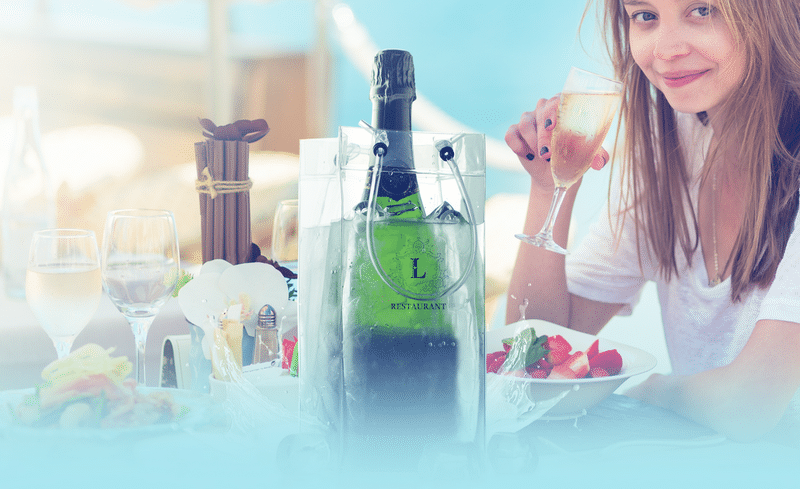 The Ice.bag® can be used for any beverage that needs to be refreshed, including white and rosé wines, but also sparkling wines and champagnes. Can we directly pour wine in the Ice.bag® with ice cubes to serve it, for example, asin a shared container ? No, it is not recommended. In effect, the PVC used to make the Ice.bag® isn’t fit for food contact. So it is not advised to drink the water or use the ice cubes that have been contained in it to refresh the bottlers, or to use it as a direct container for a beverage. What is the privileged Ice.bag® model for the CHR professionals ? 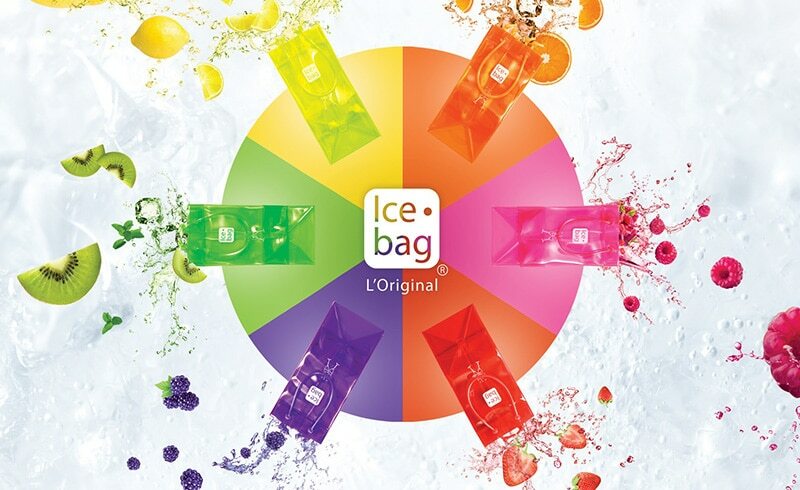 For a daily use in a restaurant, a bar or a hotel, the most recommended model is the l’Ice.bag® PRO MINI-KING (ref. 17019) which can hold 1 to 2 bottles. Specially conceived for the CHR professionals, its handles are placed on the sides and not on the faces in order to facilitate the transportation of beverages, and its reducted height doesn’t obstruct a direct service to the glass. Is the Ice.bag® stable once placed on a table ? In spit of the fact that it is made of flexible PVC, the Ice.bag® is stable enough to hold itself once placed on a table, wether it is full or empty. Join us on social networks ! Designed & Engineered in France – SAY « NO » TO COUNTERFIT! – Make sure the product bought is the original ! Ice.bag is a trademark of Gimex International and is protected by trademark, design ans models and unfair competition laws in many countries worldwide. WARNING: Any copy of the texts photographs, intellectual property rights or artistic work without GIMEX’s prior consent in wrinting is strictly forbidden.